Thinking about Abby Wambach last month reminded me that I never published my thoughts on the historical final game of the 2015 Women’s World Cup. So here’s a blast from last summer. (If you’re interested in any of my previous posts–I wrote on each of the United States games in the tournament–you can start here and follow the links at the bottom of each post through to the end). Carli Lloyd won the World Cup final for the US in 6′ and finished the game as a competitive fixture by 16′ as the United States became the first nation to win three Women’s World Cups. Comparisons have been made with last summer’s Germany-Brazil semifinal, and as in that game, Lloyd’s performance is surely something of an outlier. The United States scored on their first four attempted shots, three of them by Lloyd. But there is also no doubt that Lloyd’s stunning performance was the result of the tactical shift to a 4-2-3-1, pushing Lloyd up the field and essentially deploying her as the second striker for the United States. If there was good luck in Lloyd’s final, Jill Ellis had finally put her in a position to get lucky and she made the most of it. She was a deserved winner of the Golden Ball (though perhaps Jill Sauerbrunn or Julie Johnston would have been even more deserving were awards less biased toward goalscorers). To deserve an award for the tournament’s best player after being one of the least effective players on your team through the opening four games is a testament to her stellar performance at the business end of things. Lloyd’s third goal was one of those special ones, and scoring it in the context of a World Cup final only adds to its luster. So focused on Lloyd’s heroics were the American commentators that they largely missed the tragedy of Azusa Iwashimizu. Without diminishing Lloyd’s achievements, there is no doubt that Iwashimizu was demonstrably culpable for all of the first three US goals. On the opener, she thought she had Megan Rapinoe’s delivery covered once it slipped past Shinobu Ohno and waited for the ball, not seeing Lloyd’s (admittedly, brilliant) run into the box. Lloyd took the ball off her toes to score. For the second goal, Iwashimizu was more consciously marking Lloyd, but the American still beat her to Lauren Holiday’s ball once Julie Johnston had backheeled it past Saori Ariyoshi. Iwashimizu will feel little comfort in knowing that Ariyoshi should have stopped the ball before it got to Lloyd. The third goal was probably the most painful. Iwashimizu attempted to clear Tobin Heath’s cross in, but headed the ball up instead of out, allowing Holiday to run onto it for an electric volley that, if only for the minute until Lloyd’s midfield strike, looked to be the goal of the game. As with the second goal, Iwashimizu will find little solace in the fact that goalkeeper Ayumi Kaihori was well-positioned to save the ball and might have done better, notwithstanding the pace and power of Holiday’s shot. 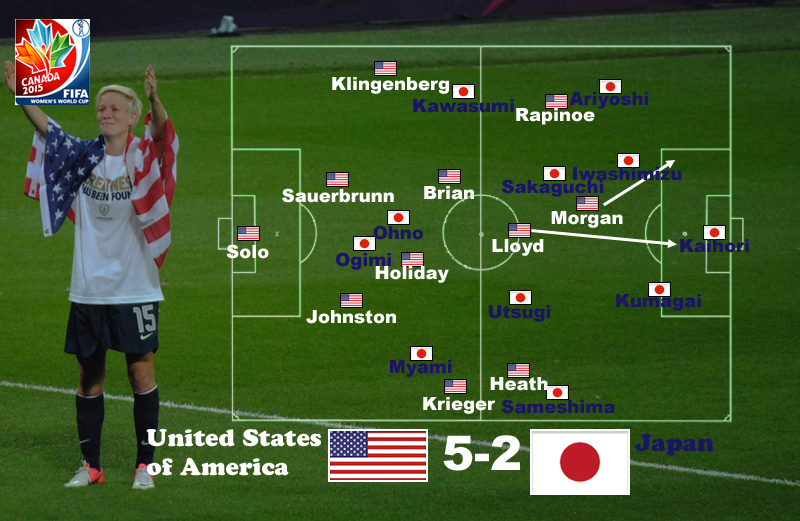 Iwashimizu was subbed out at 33′ to make way for Homare Sawa, and a brief glance at the bench during the US broadcast showed her in tears, presumably as inconsolable as Lauren Bassett had been at the end of Japan’s semifinal with England. Indeed, there was a kind of bitter poetry in Iwashimizu’s disastrous opening and its echoing of the tragic own goal which sent Japan to the final. Like Bassett, Iwashimizu had had a very good tournament prior to this dramatic conclusion. Until Lloyd’s first goal, Japan had not trailed in the tournament, and Iwashimizu had played an important role in that defensive record. Though Sawa’s introduction came well after the fourth US goal and was part of a tactical reshuffle, it is difficult to believe that manager Norio Sasaki was not also taking Iwashimizu out of the equation. Sasaki’s introduction of Sawa shifted Japan into something more like a 4-2-4, though as the half progressed Japan settled back into a 4-4-2, albeit a much more aggressive one. Even before the introduction of Sawa, Aya Miyama had moved into the middle of the pitch, Rumi Utsugi moving back to left back and Aya Sameshima pushing forward into a wing role. These changes allowed Miyama to feed Nahomi Kawasumi out right, setting up Yūki Ōgimi’s 27′ goal. Sasaki was still not satisfied, and 6′ after the introduction of Sawa he further bolstered his side’s attacking prowess with striker Yuika Sugasawa replacing Kawasumi, Ohno shifting out to right wing. Quite unlike Brazil in their historic loss to Germany, Japan were in fact the better side for the final 20′ of the first half and for most of the second. They outshot the United States and had the lion’s share of possession. It is probably a measure of Japan’s improved play that Sasaki didn’t turn to his consistently impressive super-sub, Mana Iwabuchi until after the United States had already responded to Japan’s 2nd half goal with one of their own. By that point the game had surely been decided, but Japan nonetheless dominated the final 25′-30′. As any coach will tell you, there is no reward for winning 65′ of a match. Nor is there any reason to prioritize Sasaki’s in-match tactical maneuvers over Jill Ellis getting things right from the outset. The US team’s growth is a textbook example of how a winning team usually develops over the course of a tournament. In this they certainly echo the German World Cup champions of the previous summer, who also needed to find their best formation and form during the competition itself. If not an exciting game in the ordinary sense, it was nonetheless a suitably memorable ending to a very successful tournament. At the end of the game, Ellis was able to bring on Abby Wambach and Christie Rampone, players who had little impact on this tournament but whose careers helped to set the bar for those who will return in the 2016 Olympic squad, as well as for the new faces who will join them. Wambach, who had opened the tournament by suing FIFA, ended it by celebrating with her wife and wrapping herself in an American flag. For US fans, undoubtedly the largest audience for women’s soccer in the world, it was a story book ending.